Ice dancer Alexander Gamelin has acquired Korean citizenship, making him eligible to represent the country at the 2018 Pyeongchang Winter Olympics. The Korea Skating Union said Monday the Justice Ministry approved Gamelin's application for naturalization last week. 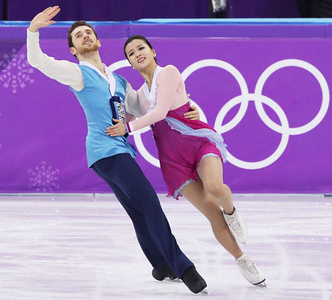 The U.S.-born ice dancer has paired with Min Yu-ra since 2015 with the aim of competing at Pyeongchang. At competitions hosted by the International Skating Union, only one member needs to have citizenship for a pair to represent a particular country, but at the Olympics, citizenship is required for both. Gamelin first visited Korea in 2015 and learned the language from watching TV series and listening to K-pop. No Korean skaters have yet secured a ticket for the ice dancing events at Pyeongchang, as the host country does not automatically receive a qualifying spot. The duo, who finished first at the national team trials last week, will compete for the ISU Nebelhorn Trophy in September. Five Olympic berths are up for grabs at the competition, which serves as the final Olympic qualifying event.